Remembering One of Star Trek’s Most Thought-Provoking Episodes! The Star Trek series has few parallels in terms of the size, fervor, and durability of its cult following. Although NBC cancelled what is now known as the Original Series after just three seasons, the franchise was just beginning. Three sequel series and two prequel series, one of which just launched in 2017, continue to keep the spirit of Star Trek alive for new generations. Trekkers travel to conventions every year, often dressing as their favorite characters, and the amount of Star Trek paraphernalia available half a century after its debut is difficult to overstate. This coin continues that tradition in a particularly poignant way. The image on the reverse is taken from an episode called Mirror, Mirror in which three of the main characters are accidentally transported into a mirror universe in which crew members of the I.S.S. enterprise have the opposite qualities of themselves. Unlike most of the other episodes in the series, which celebrate the virtues of humanity, this one forces its characters – and the viewers along with them – to examine the darker sides of our natures. 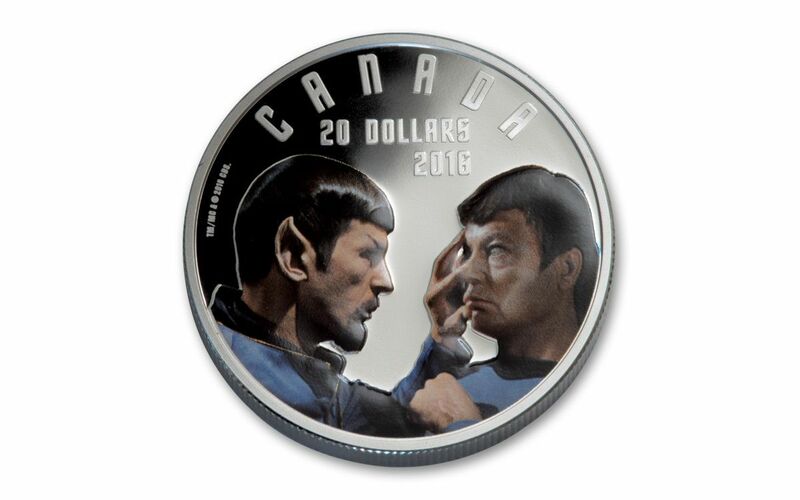 CELEBRATING AN IMPORTANT ANNIVERSARY – This coin was the second of three that feature scenes from some of the most memorable scenes in Star Trek history. 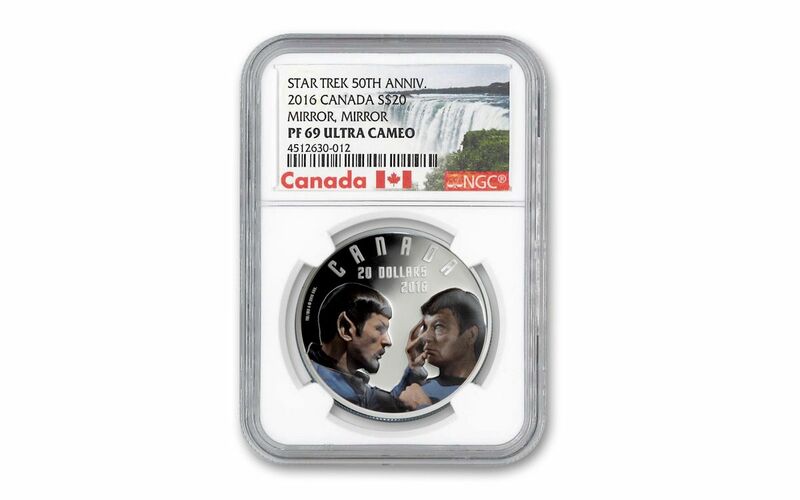 FOUR-NINE FINE – Each Star Trek Mirror, Mirror was struck from 1-oz of 99.99% fine silver at the Royal Canadian Mint. Four-nine fine purity matches the world’s standards for bullion issues. The coin has a proof finish that makes the most of that exquisite canvas. 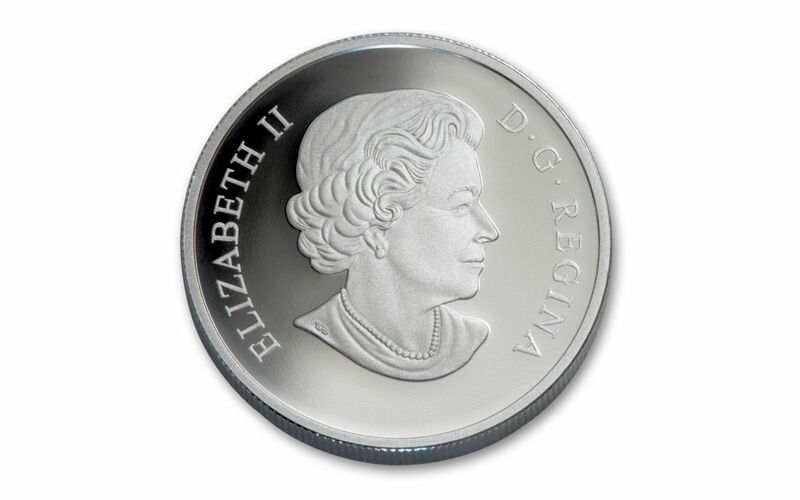 CANADIAN LEGAL TENDER – Each Canada Silver Mirror, Mirror is $20 legal tender in Canada. Canada is known not only for producing some of the world’s most beautiful coin series but also as a winter sports haven and home to some of the world’s most beautiful natural scenery. - CERTIFIED VIRTUALLY-FLAWLESS -- Your coin will be graded Proof-69 Ultra Cameo (PF69UC) by Numismatic Guaranty Corporation (NGC), a distinction that means your almost-flawless coin will showcase an impressive full strike and indistinguishable imperfections -- well above and beyond the quality of the vast majority of coins in the series. A LOW MINTAGE FOR A LARGE FANBASE! 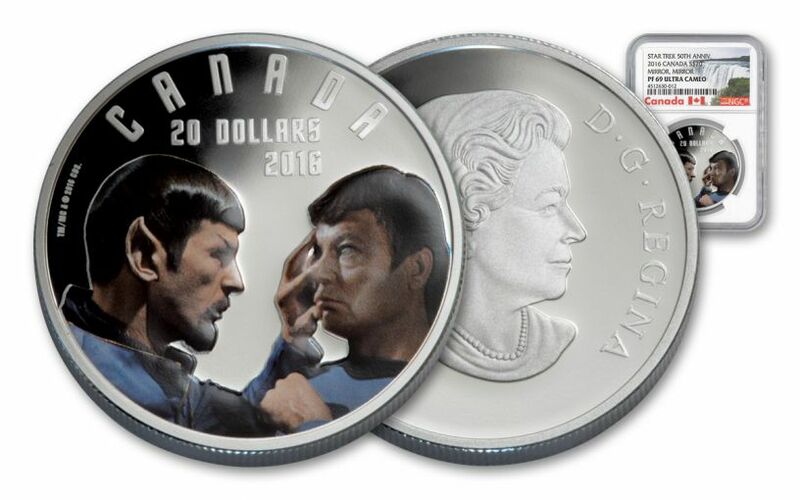 – In spite of Star Trek’s avid following, the mint released just 11,500 pieces in this mintage. Star Trek fans all remember that moment when they fell in love with the franchise, be it from one of the television shows or movies. The collection of which this coin is a part recalls three moments that drew in many avid fans. In fact, even those who are not fans of the series could not help but be intrigued by the unique storyline surrounding this remarkable scene. Do not wait to order your Silver Star Trek Mirror, Mirror at GovMint.com.